10,000 BC ← You Want Me To Wear What? I’ve said before that I don’t like gladiator heels. But at least, on the right person, it can make them look kind of terrifyingly Amazonian. This, however, is less Amazonian than Archaic. Which is all well and good, if the way you roll is biblical. Now, personally, if I’m going to be thrown into a colloseum to face off against a gladiator or a lion, I’d like to have appropriate footwear on. And, in my case, appropriate footwear is something I can run comfortably in. Not flip flops with cow hide stapled to them. 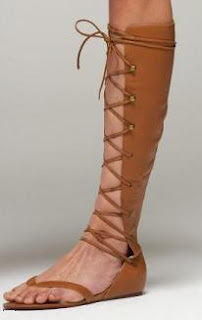 I actually love gladiator sandals, well, some of them anyway, when done right. Having a piece that has some risk attached to it, like it's teetering between fashionable and unfashionable, and yet still pulling off the piece and making it look good I feel is an overlooked, awesome part of fashion in general. Back to the shoes – They can't be too costume-y, because then they no longer fit in your wardrobe – instead they do just what these would do, which is make you look like you had no vision when looking for a new pair of shoes. They stand out, don't match, and look awkward and goofy. However, I can sympathize with larpers, especially because they're actually putting together a costume. Much of the abstraction in higher level graphics APIs is done to support a wide variety of hardware. Low level graphics APIs often are not as portable or widely compatible as high level ones, and this is also true of Metal.